All members, visitors and guests are required to wear correct formal golf attire. Clothes must be worn in a proper manner. 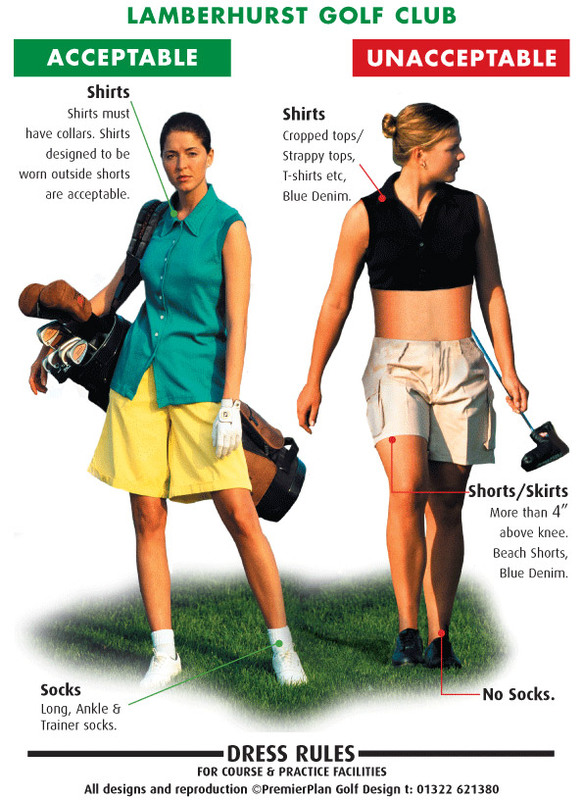 On the course and practice areas shirts must be tucked-in (except ladies' shirts with specially tailored waists); socks must be worn with shorts; shorts/skirts should be tailored and cut close to the knee. 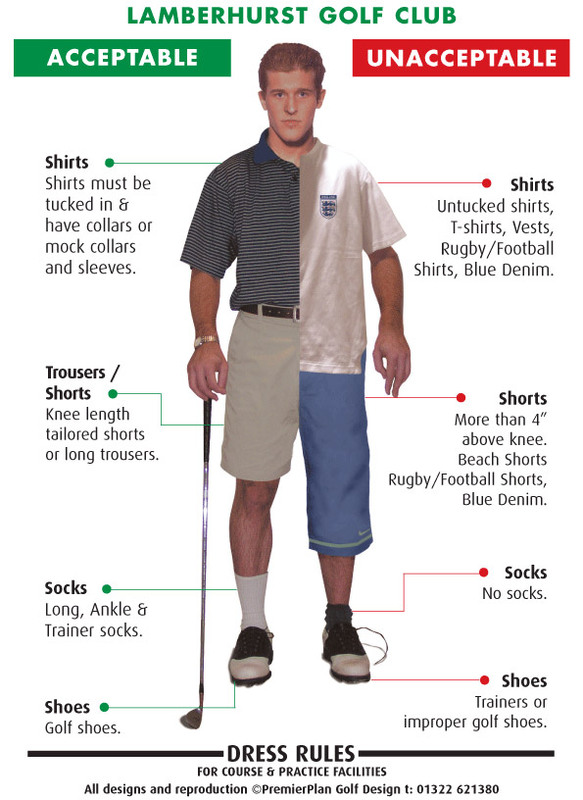 The following are not permitted: T-shirts; shirts without collars (except mock collars); shirts cut above waist level; beach or elasticated shorts; tracksuits or similar; trousers tucked into socks; caps back to front; any other form of dress deemed to be inappropriate. No head gear in the Spike Bar. Jeans are allowed in the Spike Bar and Patio but not on the course, practice areas or lounge bar and dining room. Standard - 'Smart-casual' dress and appearance as a minimum. The following are not permitted at any time: Golf Shoes; wet or soiled clothing; hats or caps; any clothing not allowed on the course, practice area, patio and spike bar; other inappropriate forms of dress. Jeans are not allowed in lounge bar and dining room. Jacket & Tie must be worn by men for representative matches and any other events specified by the Captain. Exceptions may be made for Dining & Social visitors. Club staff have been authorised to ensure that the rules are followed and will refuse service to anyone not complying with the Code, but it is the responsibility of all members and visitors to comply with the detail and the spirit of the rules and to ensure that other Members and Guests do so as well. The Club recommends that mobile phones be carried on the course for emergency purposes. They must be kept switched off other than during an emergency. For emergency calls quote TN3 8DT. Mobile phones may be used in the Club spike bar, Changing Rooms and Patio area, but they MUST be kept on SILENT. Use of phones for purposes other than calls is allowed in the Club lounge. Should people wish to respond to, or make, a voice call they must retire to the spike bar, changing rooms or patio. The Club requests that due respect is given to fellow members and guests. Phone usage not in accordance with this policy will be considered a breach of Club bye-laws.